A mid-sized winery producing about 30,000 cases annually, J. Bookwalter has been fixture in the Tri Cities area of Eastern Washington since 1982. They source this Cab from the Dionysus Vineyard on the banks of the Columbia River from vines that are nearly 40 yrs. old. This is the second vintage for acclaimed winemaker Caleb Foster who took over the winemaking from John Bookwalter in 2014. A ripe, dense wine, showing aromas of cassis, fig, damp leaves, chocolate, and graphite it leaves an unctuous first impression in the mouth, rich and heavy with a weight of woe. The marked sweetness is rescued by a layer of soaring acidity that keeps the focus on high toned fruit notes through the mid-palate and finish. Despite the massive fruit and dynamic acidity it has a tender underbelly. The tannins are exceptionally soft seeming to hide behind the bright acidity generating some tartness on the medium length finish. A lush, indulgent box-of-chocolate wine until the acid darts like lightning with a promise of hope, yet the tannins are too soft to deliver genuine power and depth. It’s searching for its soul but will get a boost when paired with a diva-delivered big ballad. 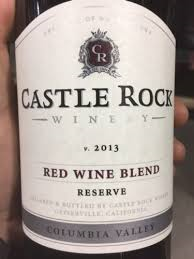 Castle Rock’s negociant, business model produces value-priced wines with some personality. And this one is no exception. They claim it’s fashioned after the “great wines of Bordeaux”. But Bordeaux has nowhere near the sun and temperatures of the Columbia Valley. This is no Bordeaux but it’s not jammy or alcoholic either, and it’s made from Cabernet and Merlot so there’s that. Black cherry, charred wood and smoked meat aromas make you think barbecue. On the palate it’s simple but structured, dry with sneaky, medium-grain tannins and bright medium-plus acidity. The charred wood carries through on the palate, but chocolaty, midpalate richness blooms before turning nervy and taut on the finish. Very nice with steak, this one grows on you, a wine for grown ups. I’m increasingly finding solid budget wines in the organic wine section of the supermarket. This one also boasts no added sulfites so if “natural” floats your boat this one hits on several criteria. Very ripe red apple is dominant right out of the bottle, with floral notes, tangerine hints, and wet stone playing a supporting role. The ripeness starts to edge into funky-in-a-good-way territory which always gets my attention. The palate is off dry and static with a heavy mouthfeel, but very crisp acidity keeps the wine in balance. The finish is tart and citric with good length. With 1.4% residual sugar, this will taste overly sweet to some people. After all it is a Riesling; the best ones often have some sweetness. Recommended for those evenings when you need a wine to serve with a sweet sauce. This wine certainly developed in an unexpected way. Despite 10 years from vintage, it is still dark ruby in the glass with slight rim variation and no evidence of bricking. Black cherry, sandalwood, tobacco, and cocoa aromas are now cosseted in a bouquet of forest floor that develops charm and intensity as it aerates in the glass. The palate is full bodied with an initial round, lush, juicy impression that gives way to lively acidity that seems to gather energy under a black licorice core before bursting into pronounced charred wood and dark roast coffee that lingers on the palate for well over a minute. The tannins have softened into a silky, languorous bed; the wine is not in the least grippy. But the enduring, intense charred wood note on the finish gives it a fiery aspect that is wholly unexpected. The process of aging is often a battle between fruit and oak. Will the fruit remain dominant with integrated oak providing a muted halo of toast and nuts or will the woodsy notes of the oak joined by caramel and dill leap to the foreground? This wine still has ebullient fruit but the woodsy notes appear to be winning the battle at the moment. I have tasted several vintages of Col Solare upon release. While the oak was certainly a presence I would not have predicted this unusual evolution. It gets character points for originality and palate intensity. Col Solare is a collaboration of Chateau Ste. Michelle and the Italian producer Antinori. A complex blend from several vineyards, this vintage was 72% Cabernet Sauvignon, 19% Merlot, with a small percentage of Cabernet Franc, Petit Verdot, and Syrah. The wine was aged in 75% French and 25% American oak, 100% new for 21 months. It is drinking well now but has several years of life left. I highly recommend decanting to get the wine to calm down. Long Shadows is a great idea. Build a state of the art facility, source from the finest vineyards in Washington State, and hire famous winemakers to make your wine. Sounds like a can’t miss formula. But winemaking isn’t about formulas and even at the high-end level it can be a mysterious business. This Bordeaux-style blend doesn’t quite work. It’s not a bad wine; it just doesn’t meet expectations based on the reputation of the winemakers (Philippe Melka and Augustin Hunneeus) and price. 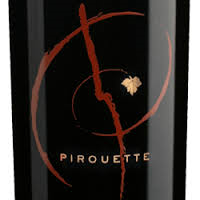 Made from 63% Cabernet Sauvignon, 19% Merlot, 12% Petit Verdot, 6% Cabernet Franc primarily from Red Mountain and Wahluke Slope and spends 22 months in 75% new French Oak. Longshadows is an intriguing winery. 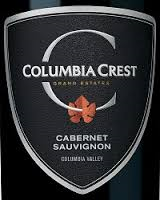 Founded by legendary Washington wine pioneer Allen Shoup, he hires internationally-acclaimed winemakers as partners in the production of their lineup. I’m hoping this is a one-off misfire. We’ve learned to enjoy dissonance in our music; will we come to find dissonant wines pleasing? Here’s the master of dissonance Arnold Schönberg’s “Verklärte Nacht”. This wine actually becomes more intelligible with such accompaniment. It has become a truism that we live in a world awash in quality wine at good prices—a fact to which these two Rieslings testify. Both are off-dry with complex aromas and lively acidity but exhibit distinctly different styles. The Trader Joe’s offering is soft and relaxed with lots of red apple and tangerine, supported by muted wet stone notes and white flowers. The palate is clean and crisp with a soft, creamy mid-palate but a disappointedly short finish. The Hogue is a bundle of energy and pizzazz with more intensity on both the nose and the palate. It opens with a blast of wet stone minerality, which resolves into classic petrol notes and grapefruit. The petrol is unusual in a young, inexpensive Riesling. Bristling acidity provides a mid-palate mineral boost that persists all the way through an unusually long, flavorful finish. This is a quite serious wine and an amazing bargain. The TJ is a comfort wine; the Hogue is all about stimulation. Some green, vegetal notes mar the nose but warm baking spices and vanilla support berry aromas and hints of candied cherries all of which provide a sufficiently pleasant aromatic prelude to the feature presentation—a palate striving for suave sophistication. 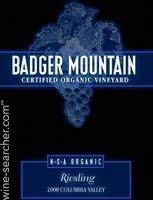 Soft and plush with a velvety texture, medium bodied, and very polished, with candied cherry the dominant flavor note, the warm, easy-going mouthfeel is the selling point of this wine. Very fine grained tannins produce a pleasant finish but the whole thing is confected. Some residual sugar is apparent, the mid-palate is a bit hollow, the flavors relatively simple. This is a wine without much soul but if you want the companionship of a pretty face for the evening this will do fine. 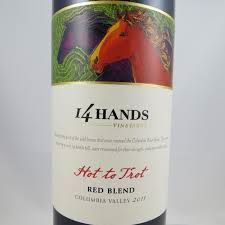 This is a blend of primarily Merlot, Syrah, and Cabernet.